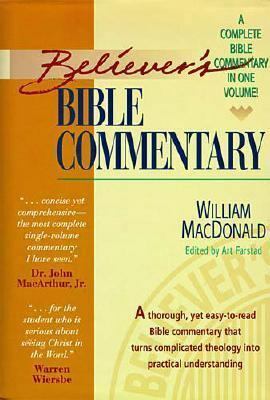 by MacDonald, William, Farstad, Arthur L., Farstad, Arthur L.
MacDonald, William, Farstad, Arthur L., Farstad, Arthur L.
Make Bible study a part of your daily life with the thorough yet easy-to-use Believer's Bible Commentary. MacDonald tackles the controversial issues head-on, taking a theologically conservative stand, yet presenting alternate views with fairness. The Believer's Bible Commentary is a friendly guide to exploring the deeper meanings of every biblical book.Features: Nelson's best-selling Bible commentary Balanced approach to linguistic studies and useful application Easy to understandMacDonald, William is the author of 'Believer's Bible Commentary/a Complete Bible Commentary in One Volume A Complete Bible Commentary in One Volume' with ISBN 9780840719720 and ISBN 0840719728. Loading marketplace prices 8 copies from $5.46 How does the rental process work?